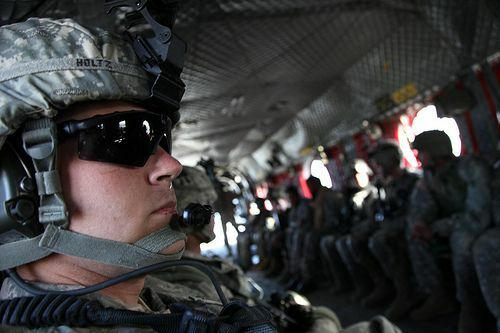 US Army 2nd Lt. Payton Holtz, from St. Augustine , Fla., leader of 1st Platoon, from Alpha Company, 3rd Battalion, 187th Infantry Regiment, 3rd Brigade, 101st Airborne Division, flies in a Chinook helicopter during an air assault mission. The mission was meant to disrupt an insurgent hiding cell in Janubi Nakum village, Yahya Khel district of Paktika province, June 27-28. Photo via the US Army by Sgt. Jeffrey Alexander.